You must be a member of the Brussels Book Group to attend this activity. Would you like to join this group? 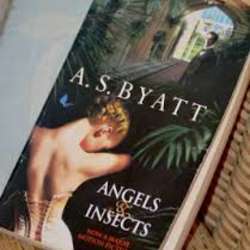 As second book for Protected content , we will tackle a female writer and move to Victorian England with the 'Angels and Insects' of A.S. BYATT. In these breathtaking novellas, A.S. Byatt returns to the territory she explored in Possession: the landscape of Victorian England, where science and spiritualism are both popular manias, and domestic decorum coexists with brutality and perversion. Angels and Insects is "delicate and confidently ironic.... Byatt perfectly blends laughter and sympathy [with] extraordinary sensuality" (San Francisco Examiner). Curious to find out more ? Read the book and join us for another one of our interesting discussions ! Even if you don't manage to read the book entirely, you remain more than welcome to take part in our talks !